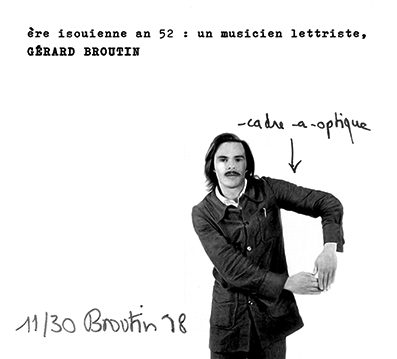 Special edition of 30 copies, signed & numbered, wiith „cadre-a-optique“ writing by Broutin. First ever release of the text-sound pieces by French lettrist artists Gérard-Philippe Broutin (b. 1948). Broutin studied Art History at the University of Paris and the École du Louvre. Alongside other artists such as Maurice Lemaître, Roland Sabatier, Alain Satié, François Poyet or Jean-Pierre Gillard in particular, Broutin meets Isidore Isou in 1968 and from then on participates in most of the events and literary exhibitions of the lettrist movement. The remarkable lettrist text-sound pieces contained on this CD were written during the early 1970’s and recorded and broadcasted at Radio France in September 1976, with introductory texts by Jean-Pierre Gillard.